What’s pop’n Diesel Dolls & Dudes? 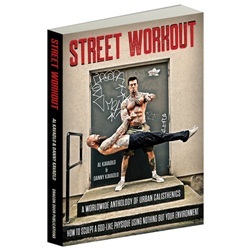 Dragondoor just released their first ever Progressive Calisthenics Calendar featuring photos of the Kavadlo brothers, and other PCC Instructors, including yours truly! It looks glorious!! Be sure to pick up a copy today or before October 31st to receive $5 off the original price! This calendar inspires me to want to hit the playground! Don’t forget it’s the holidays, get one for you and yo mama! I’m about to send one to my folks now! 😉 Have a fantastic Thursday! Peace, Love, and Ninja Kicks!